Last week, I bought about a million pounds of sliced pork tenderloin from Costco. On top of the usual Costco bulk discount, there was a “manager’s special” which brought the price down an additional ~20%! I wasn’t exactly sure what I was going to do with twelve huge hunks of pork loin, but there was one thing I did know: pork tonkatsu was definitely on the menu this week! Tonkatsu is a Japanese food where pieces of meat (usually pork, but I’ve also seen chicken) are breaded and fried. It is key to use panko (bread crumbs ), which are Japanese style bread crumbs. They give a delicate and very satisfying crispy crunch. The tonkatsu is usually served with tonkatsu sauce , which totally makes the dish, so be sure to pick some up before making this! Once you’ve made it once or twice, the dish is surprisingly quick and easy to make. Take this past Thursday, for example. The plan was to get home by 5:30pm and have dinner ready by 6:15pm. Instead, I found myself calling my husband at 5:45pm to start the rice, and I got home just a little before 6:15pm. Still, dinner was hot and ready on the table by 6:30pm! 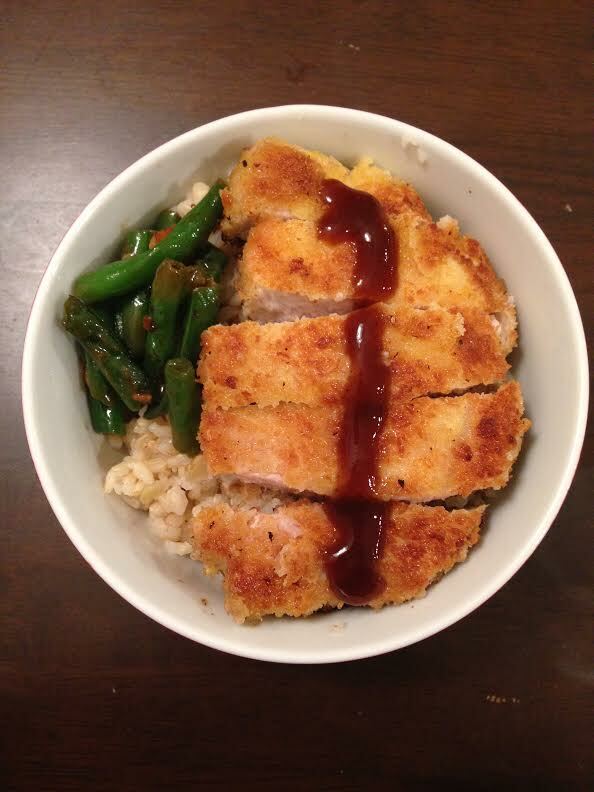 This feat was accomplished partly thanks to Ben’s help in washing and trimming the veggies and getting the rice ready, and largely thanks to this SUPER quick, easy, and delicious pork tonkatsu recipe I’m sharing below! When I got home, I just threw some flour in a bowl, eggs in another, and some panko crumbs in a third bowl. This is also known as a breading station. I seasoned each bowl with a little salt and pepper, breaded my pork, and threw ’em onto the hot oil. Mere minutes later, I was turning over beautiful, golden-browned crisped pieces of tonkatsu that made our mouths water. It also made my clothes reek of fried food (worth it). We had a friend staying over this week, and she plated her food nicely and snapped a photo before diving in (see first photo). When she kept asking specifics of how I made it– “You just bread it?” (Yep!) “Did you season the pork itself?” (Nope!) “That was fast!” (Yep! ), it confirmed the share-worthiness of this recipe! Breading just means I coated a cutlet in flour, then dipped it into the eggs, then coated it with panko crumbs. 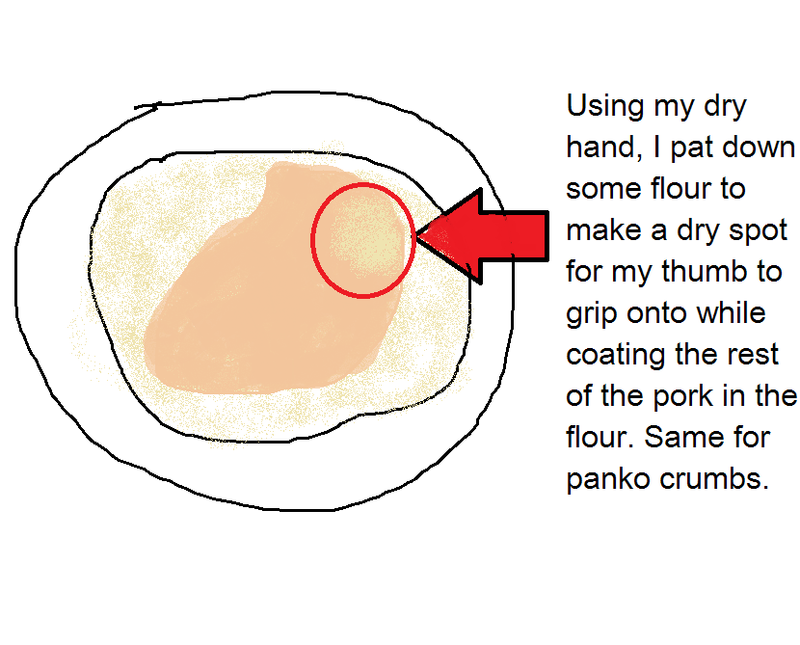 One tip for breading: designate one hand as your “dry hand” and one hand as your “wet hand.” When coating with dry ingredients (flour and panko), only use your dry hand. When dipping into the wet ingredients (egg), only use your wet hand. This way, you won’t end up breading your own hand in a gunky mess (which A. B. refers to as “club hands.”). I had also served this to my parents a couple weeks ago, and to my delight, they loved it! They were also particularly interested in the brown rice I served it on. It was light and fluffy and delicious and brown. So in case you’ve been on the hunt for a yummy, fluffy brown rice, we love our Nishiki brown rice. It does take a little longer to cook, but the result is a taste as close to white rice as we’ve found (while being a little healthier). My mother in law actually recommended it to us, after her friend recommended it to her. Apparently, her friend’s family had taste-tested their way through several varieties of brown rice before settling on this one, which was kid- and parent-approved! I got my 15-lb bag for about $17 at Ranch 99. I think this is a great dish to serve up when you need something quick and easy. If you’re new to breading, it will feel messy and like a bit of a hassle the first couple times, but once you’ve got the hang of it, it really is quick work. If you’ve never tried tonkatsu, give this a go! It is every bit as tasty and delicious as it looks! 1. Set up your breading station (see image above). Set out 3 wide bowls and then a plate, all in a row. Fill the first bowl with flour, the second with beaten eggs, the third with panko. Season each of the bowls with salt and pepper and mix to combine. The plate is to hold your breaded cutlets before pan-frying. 2. Cook: Heat a large skillet with about 1/2 inch of oil until hot. 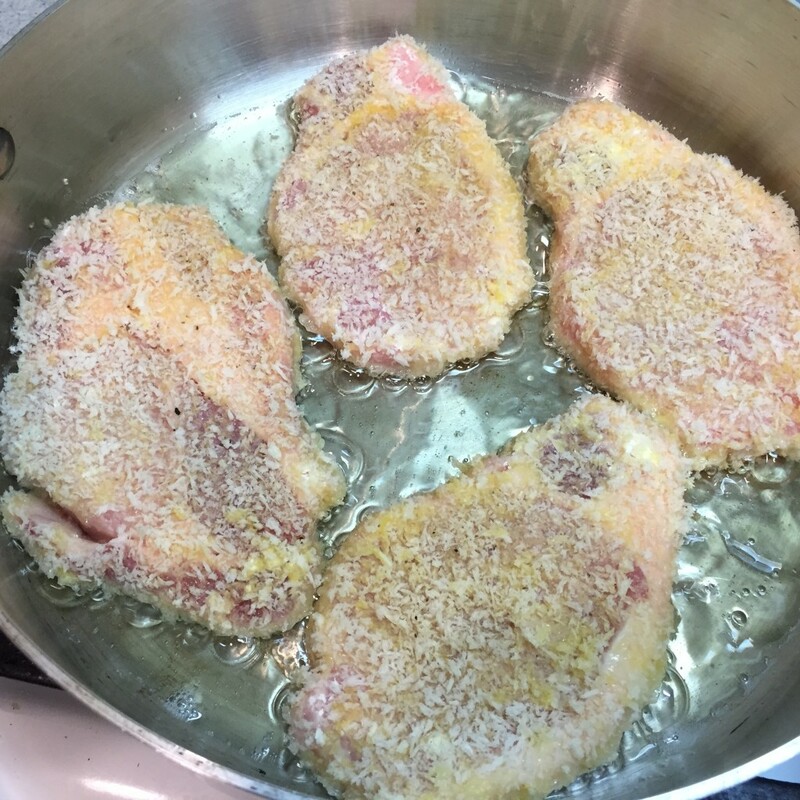 Carefully lay breaded cutlets in the hot oil, being careful not to crowd the pan too much. Fry until golden-brown, about 3-5, minutes, then turn and fry for another 3-5 minutes until cooked through. Drain the cooked cutlets on a plate lined with paper towels. 3. Serve: Cut each cutlet into strips and drizzle with tonkatsu, or have a small bowl of tonkatsu on the side for dipping. Serve with rice and vegetables. This was even more delicious than what my picture portrayed 🙂 Thank you for being lovely hosts! Go, go! Especially to Kyoto! I hope to! Somedayyyyy :D.
Great recipe! I lived in Japan for a little over 5 years, but became a vegetarian after the first year. The smell of tonkatsu and izakayas would haunt me!! 😉 Might make this one night for my husband as a surprise, thanks! Wow, five years!! That’s awesome! I haven’t even gotten to visit Japan yet, but I will eat like a monster when I do someday :]]. Hmmm, I will have to keep this one in mind! Often I start dinner at 4:45 while also trying to keep little ones out of the kitchen – which isn’t a great frying situation… but maybe I could try this for a weekend. I’ve been eying more pork recipes as chicken and beef are really expensive up here right now, I’m not sure why! Thank you for sharing! Yes! Let me know how it turns out if you try it! Yummy! Thanks! 🙂 Ben loves eggs!